View of the Lake out each window! Private, kayak included. Looking to unplug and get away from it all? Point Cabin is the place for you! Located on the beautiful Wildcat Chain of Lakes, the Point Cabin is just 4 miles north of Boulder Junction. Nostalgic accommodations offer privacy along with comfortable and clean amenities for a truly relaxing stay. The chain includes Big Kitten, Little Kitten and Wildcat lakes offering a diverse fishery, islands for paddling exploration, wonderful wildlife viewing, and crystal clear waters for both reflection and recreation. Adult guests enjoy use of a Wilderness System Pungo 120 kayak, paddle and personal flotation devise are included. Cabin amenities include a private pier, sandy and level lake frontage that surround a peninsula, perfect for paddlers and peaceful swimming, lakeside porch with beautiful sunset views, and lake views from every room. The Point can accommodate couples and families of up to 5. It features 3 bedrooms, one with a King bed, one with 2 twins, and one with a single twin. Your stay includes bed linens and towels, so bring only personal items. The kitchen has a full-sized refrigerator, 4-burner stove with oven, microwave, coffee maker, and is fully equipped with pots, pans, dishes, glassware and utensils. Enjoy cooking outdoor meals on a Weber grill. The Point Cabin, while privately owned, also offers full access to the resort's private beach, outdoor fire area, tennis court, playground, watercraft and more. Pontoon rentals and firewood service is also available upon request. 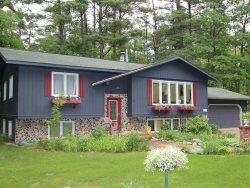 If you have a larger group, the Birch Cabin is within walking distance and accommodates and additional 6. Nice cabin feel on a quite lake. We will be back! Julie is easy to contact and is generally quick to respond to emails. It would be good if other cottage visitors used conversational voices that didn't carry and echo off the lake. Children shouldn't be allowed to holler and yell for their family members. With that said, I realize there isn't much you can do to solve this problem. I know you provide reminders in the rentals about proper resort/lake etiquette. Julie was very prompt in returning calls and providing details about the cabin. Would like to book again for next year and possible add another cabin for other family....	Tell us about your favorite feature of the property. Love how it overlooks the lake and is private, even though part of a resort setting. cute cabin--great games for the kids to play. We personally enjoyed not having a TV--really was able to disconnect and focus on family. Airbnb helped facilitate the communication between us and our host regarding a family emergency, which cut our trip quite short. We had a serious family emergency that required us to abruptly end our trip 5 days/4 nights early. Our hosts graciously gave us a credit for our unused time. We will long remember their kindness. We can't wait to get back up there to use our credit. We plan on visiting this property every year or every other year into the foreseeable future.....What additional services or vacation property features would have added to your overall experience? It would be super great if the cabin had a washer/dryer combo. However, there isn't really room for it and not having it doesn't take away from the pleasure of being there. Julie was prompt and responsive. Gave me a tip to use their website directly instead of AirBNB and saved $80. Loved it: perfect in every way. Highlight was listening to the peeper frogs at night and the loon yodeling on the lake to mark his territory. And watching the crescent moon sink behind the pines after watching the most gorgeous multi-colored sunset. Thanks for all! Tell us about your favorite feature of the property. Location and how equipped the cabin was. Being on the point was much more private than the other cabins and the view couldn't be beat. Loved that the cabin had absolutely everything we needed and space was used so efficiently. We loved the deck, fire pit, pier, and the use of canoes/kayaks. It was perfect and Big Kitten/ Wildcat are beautiful and wild.